Boss in bronze gilt, Ireland 850-900, 1 circular boss diameter 5,8 cm, with flange decorated with angular four strand interlace, the dome with circular triskele motif at the centre above 3 semi-circular panels each with a central vegetable motif with interlaced tendrils, separated by 3 vertical panels with an interlaced mythical animal in each, all in a fully developed Insular style. The triskele motif is in the style of the cathac (leather outer case) of the Book of Armagh, compare also the Lough Kinale cumdach. Secondary brass fittings for an iron needle for later Viking re-use as a brooch. Identification courtesy Dr. S. M. Youngs, British Museum. 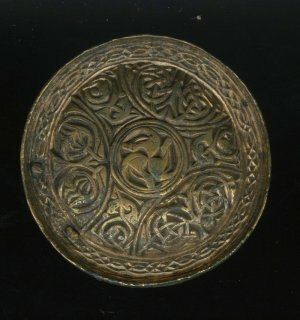 The original jewelled treasure bindings as well as the cumdachs of the Book of Kells and most other Irish Gospel MSS are lacking, ripped off during Viking raids on the monasteries, the metalwork and jewellery given to Viking women, mounted as brooches with iron needles. 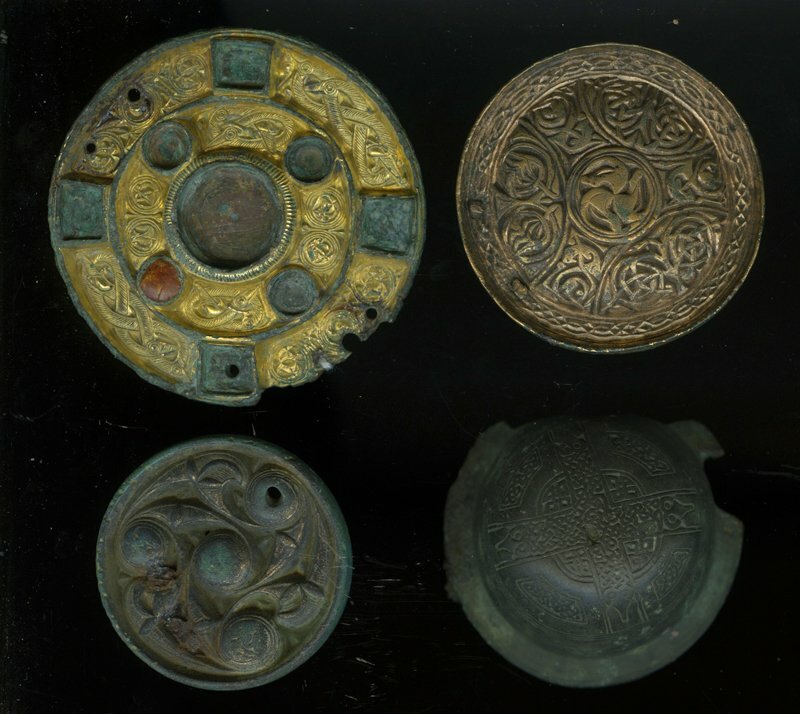 Part of a hoard of 19 Viking and Irish iron and bronze artefacts found at Stange in Hedmark in 1890 and presented by the Schøyen Collection to the library of Oslo katedralskole in 2016. Provenance	 1. Monastery in Ireland (850-900); 2. 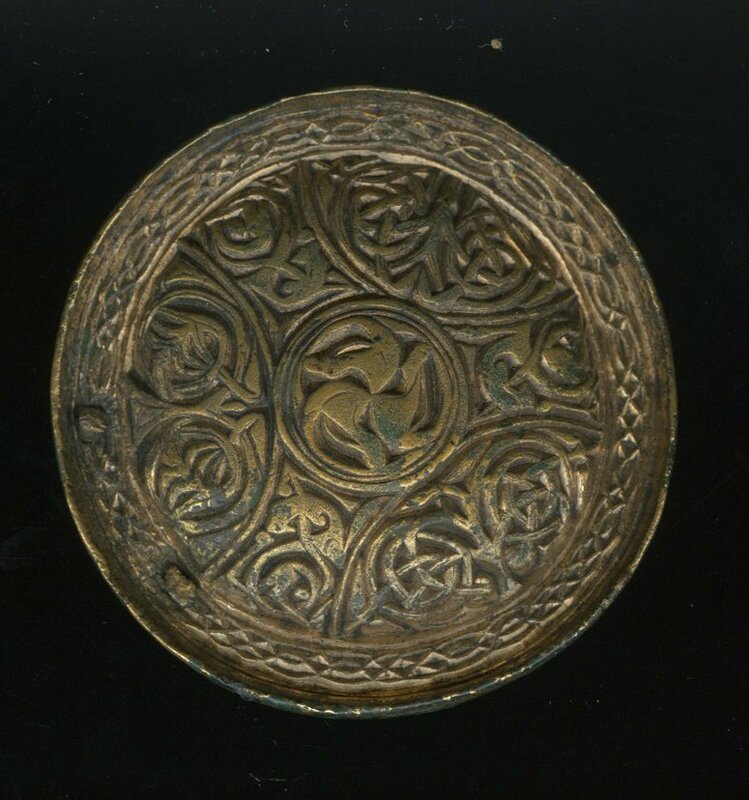 Taken by a Norwegian Viking, given to his woman in Stange, Hedmark, (ca 850-950) and buried with her; 3. Excavated by a farmer in Stange and kept in three generations of farmers (1890-1992); 4. Knut Erik Bergan, Oslo, acquired November 1992; 5. Gift from the Schøyen Collection to the library of Oslo katedralskole October 2016.